Next up on the blog, a disc that isn’t a radio transcription, but still has some historical interest. I thought it might be a radio show when I saw it in an online auction a few months ago, but it turned out to be something more rare. The disc appears to have been prepared for a display at an automobile show. The narrator highlights features of the new 1952 Hudson, presumably as one or more of the actual cars were shown off, including “Hudsonaire Hard-Top Styling”, Hudson “Step-Down Design”, and Hudson’s “Triple-Safe Brakes”. This makes the second time I’ve run into transcriptions that were pressed up for playback at public exhibitions. A few years ago, I found two Columbia transcriptions made for exhibits at the 1933 Chicago World’s Fair. It’s likely the Hudson disc was played for audiences as the cars were shown, perhaps with some live models showing off some of the features talked about on the disc. Our mp3 was transferred from an original sixteen inch vinyl transcription pressed by RCA, matrix number E2-CM-2740. You can’t really read the label in the image, but it’s very lightly typewritten and only reads “1952 Hudson Auto Show”. Now let's take a look "behind the scenes" of old radio. "Breakfast in the Blue Ridge" was a popular syndicated country music program featuring "National Barn Dance" performers Lulubelle and Scotty. In this post and the next, we hear two sides of the Audition disc for the series, circulated to station programmers and advertisers. First off, we hear Lulu Belle and Scotty and their announcer Jack Stillwell giving us their pitch for the series, which is modeled on chat and talk morning shows like "Tex and Jinx". Lulu Belle and Scotty were originally from Boone and Spruce Pine, North Carolina and were quite popular in the 30s and 40s in the early country music scene. After their retirement from show business, Lulu Belle served two terms in the North Carolina House of Representatives and she was her memory was honored by a resolution of the NC legislature in 2001. 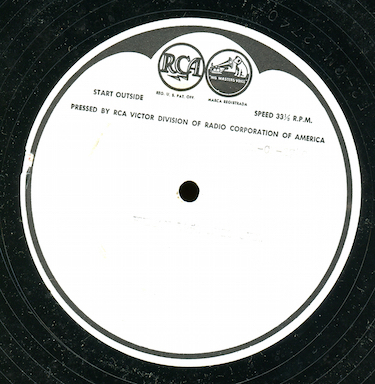 The program was digitized from original vinyl transcription from Brinkley Recording Company, 232 E. Erie Street, Chicago made for Attractions, Inc. The disc label, by the way, spells her name as "Lulubelle", but references on the web show her proper name as "Lulu Belle"
Now, following from the previous post, here's the sample episode of "Breakfast in the Blue Ridge" from the flip side of the audition disc. The first song is "The Charming Black Mustache". The show was digitized from original vinyl transcription from Brinkley Recording Company, 232 E. Erie Street, Chicago made for Attractions, Inc. If you've been listening to the World Program Service Christmas dramas the past couple of weeks on the blog, you might wonder what other kinds of material are contained on these station library discs. Listener Micheal Utz donated a fun one to my collection. World Program Service Disc 191, "World Commercial Jingles", is a fun series of generic vocal jingles that might have been used as part of commercials at a local station in the 40s, and 50s. The cuts, repeated in pairs on the disc, are for a beverage, ice cream, and drive-in movie theaters. The cuts were transferred from original World Program Service red vinyl vertical cut transcription, matrix number BB-50213-A1.